School districts around the country are debating whether or not to require seat belts on school buses. Requiring seat belts comes at a high cost for school districts already struggling with tight budgets. School buses are designed to protect riders with seats that are close together and padded, but five to six students still die every year from accidents. Most districts do not have seat belts on their buses, citing that buses are already the safest method of transporting children to school and that money could be better spent elsewhere. Advocates want to install seat belts as additional precaution to prevent as many injuries and deaths as possible. Three-point belts that cross the lap and shoulder help keep students in their seats in the rare instances when buses roll over. 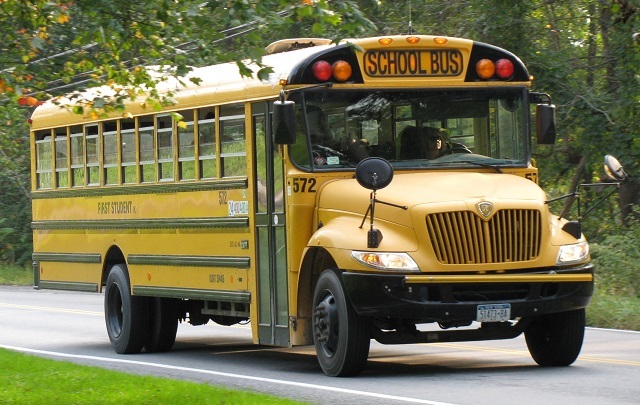 Essential question: What are the best ways to help keep students safe on school buses? Do you think school districts should require all buses to have seat belts? If your school bus had seat belts, would you wear one? Why or why not? Sarah Seale contributed to today’s Daily News Story. Visit PBS NewsHour Extra for more education resources designed to help teachers and students identify the who, what, where and why-it-matters of the major national and international news stories. Information for bus drivers, teachers, and support staff about a campaign for increasing school bus safety.